Previous GT Group owner and chairman Geoff Turnbull, left, with Knorr-Bremse board member Thorsten Seehars. Commercial vehicle braking and control systems manufacturer Knorr-Bremse is waiting on a regulatory go-ahead for its GT Group takeover. 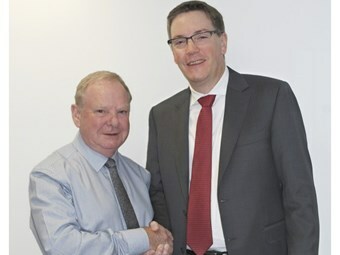 Known in Australia for its commercial vehicle braking and control systems, the German manufacturer will gain UK-based GT’s diesel engine exhaust gas recirculation (EGR) and exhaust brake expertise along with the rest of its core business in valves, seals and couplings for heavy machinery and the petrochemicals production. "The strategic fit of GT Group to Knorr-Bremse and the strong position of our combined businesses will enable us to meet the needs of our worldwide customers regarding the emission-compliant operation of diesel engines even more comprehensively," Peter Laier, the Knorr-Bremse executive board member responsible for its commercial vehicle systems division, says. "We access in-depth know-how in new technologies as GT’s mechatronic exhaust valves complement Knorr-Bremse’s existing product portfolio in Asia. "Therefore we are planning a close engineering collaboration especially between GT Emissions Systems and our subsidiaries in Japan and China. "Together with the GT Group we are aiming to grow in new regions and strengthen our market position in Europe and North America. "This way Knorr-Bremse will take a further step toward its declared aim of offering integrated system solutions and subsystems that boost customer benefits, reduce costs and ensure both the safe and efficient operation of trucks, trailers, and buses over the entire life cycle." A purchase price was not given and the move is in keeping with an acquisitive trend for the company. The GT buy comes as its rail arm buys Hungarian rail braking systems manufacturer Rail Systems Budapest and three weeks after it gained inside running in the autonomous-driving sector with the purchase of German company Tedrive Steering Systems, which makes rack-and-pinion and recirculating ball steering gear systems. On Tedrive, Laier cast the buy as "the logical next step in expanding our systems expertise". "Together with the steering expertise of tedrive, this core competency of KnorrBremse opens up additional opportunities to supply our customers with highly integrated and efficient system solutions." The company notes that autonomous driving "predicates control of longitudinal and lateral vehicle dynamics independent of driver input".